Before leaving the island we knew we wanted to do Dining in the Dark at Formaggio Grill in Kailua one last time. This time we really did it right by getting a big group together so we had the room to ourselves. 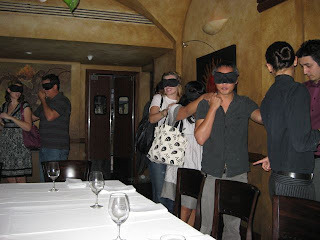 First we put our blindfolds on and they lead us in. I made sure I had my protective napkin in place. And as usual you start with the silverware. But eventually you just move onto hands. Jorge and Bethany: That looks so yummy. Good Luck to both of you in all your new adventures. It's kinda funny that they lead you in with the blindfolds on, wouldn't it be a bit safer to sit down then put the blindfolds on? LOL I guess you guys are just THAT dangerous. It sounds like a great fun time there, if I ever make it to Hawaii I definitely wanna check it out! This always sounds fun, I want to try it. Thanks Jorge. You seem like a genuine dude and it's awesome that you keep giving us a glimpse into your life. It feels very personal, and it (hopefully this doesn't sound mega-uber-weird) even inspires me. Is that Ken and Nestor? Cool! Were there any other Lost actors in your group? It looks like Ken Leung in the first picture and Nestor Carbonell in the second. Man, I miss the show so much already. Aloha Jorge and Beth and Nunu. sad. At least you will be close to the islands ,from LA, for a quick homesick visit if you need to. Best wishes on your futures. Hope to be seeing you soon on the small or large screen. Looks fun! Next time we're back in Kailua I'll have to try it. This is totally unrelated, but there is now a Facebook fan page called "Help me get Jorge Garcia on Glee!" You'd be great! I hope you will continue "dispatching", though leaving the island, Jorge! A lot of us anxiously await what lies ahead for you! "Hey, is that symbolic? We were in the dark for six years, not knowing what we were watching, and they're in the dark not knowing what they are eating." We gotta give that Formaggio thing a try--get some adventure. Mahalo to you and Bethany, great show, great podcast. We'll miss seeing you around Kailua! Holy crap. All dining should be done this way. The freedom! Actually, ideally, one would be a czar of some sort and force everyone else to eat blindfolded. I really really really gotta do this- maybe here at the house. with all the chefs and foodies we know- it would be a blast to try! Dude we are lost without Lost. we will miss Hurley too =/. so I wish you well in this new way of your life. Jorge keep rocking man, you are the best!!! We will miss you Jorge. Incredible show, you should be very proud of yourself. Jorge, if this is your last post for this blog, I just want to let you know how much I've enjoyed it. It's like I've been keeping up with a friend. I hope all goes well for you and Bethany. May you be able to host a pumpkin carving party wherever you go! I hope your adventure in LA starts out well. I'll be thinking of you both fondly. 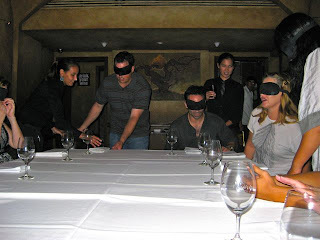 I'm not sure about that - I'd be worried that everyone else in the room had removed their blindfolds after the first 5 minutes and were laughing at me smearing my food round my mouth! I only discovered your blog this week (through Cake Wrecks - odd!) and wish I'd been following it earlier. Thanks for the past 6 years - we've jumped through all kinds of hoops in order not to miss an episode of Lost, even paying a friend with chocolate to video it for us when Sky rescinded the viewing rights from our cable provider for 2 years. The finale was terrific and did not disappoint - so relieved it came to a proper conclusion. Good luck in your future endeavours - hope the blog continues! I've never heard of such a thing. I'd be afraid they'd serve something weird. This is creepy! It reminds me of that movie 9 1/2 Weeks. Don't develop the habit of wanting to eat like this all the time! I guess they give you all you need or they´d put all you need close to yo...because if they put some tray or bread in the middle of that so wide table...difícil to find it jeje. Ah,I already saw Libby in the church with you. Have a nice time in this new stage ! The Wizard of Oz is my all time favorite movie. And I now know how Dorothy felt saying goodbye to the Scarecrow. "Jorge I will miss you most of all"
what if you don't like what they bring you to eat? I could never eat there, I would have to see the food. I would be a little spooked about eating food that I couldn't see. While I'm not allergic, there's some food that I just loathe (rye, coconut, wasabi), and if I got that it would totally ruin the evening. Now, if I could say what foods I didn't like so that they wouldn't serve me those ingredients, I might just try it. Please, please, please keep posting. Your writing is delightful. I met you through Lost, but getting to know you through your blog is so enriching. 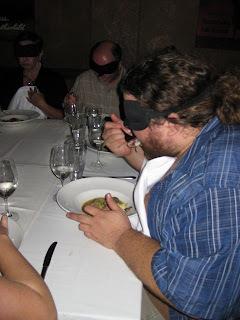 I am waaaaay too paranoid to ever eat without the lights on, let alone a blind fold. Sorry to put this in comments, but I didn't see an email link. Jorge is a very special person. Thank you for the good moments that you gave us in the series.I will miss you!. hi dude. I really hope to you and to all the cast of lost to have fortune for the future. I cried very much watching the final episode, in particular for the last minutes. A question: what was that plane that passed by over the island in the end? flight oceanic 815 or flight ajira 316 leaving the island with kate, claire, miles, sawyer, richard alpert, lapidus ? i think it was flight 815, the some we saw in the first episode of season 6. Too cool, I would LOVE to visit a restaurant like that! Keep blogging, please, I enjoy your blog so much! !